Gauhati High Court, Judicial Academy, Assam. There are total 75 vacancies available in Gauhati High Court recruitment for Stenographer Jobs. Last date for submission of application form is 27-11-2018 till 05:00 PM. Online mode of applications only accepted for this GHC Stenographer vacancies through official website of Gauhati High Court @ghconline.gov.in. Selection will be based on Written Test, Typing Test and/or Interview. For more details regarding GHC Stenographer Grade 2 and Stenographer Grade 3, Attendant, Cook, Driver and other jobs recruitment age limits, exam pattern and syllabus information, vacancy details, qualifications please see below provided data. 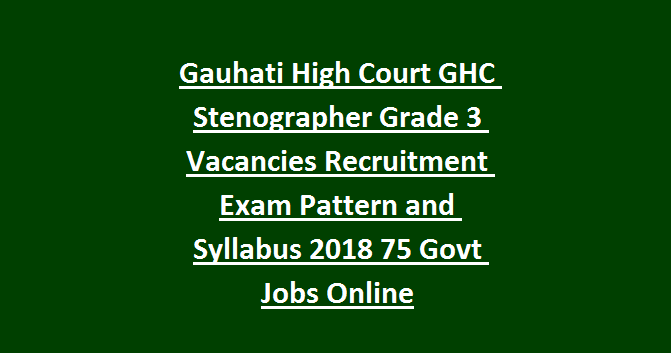 Click here to see the Stenographer Grade III Jobs notification of Gauhati High Court Recruitment. There are total 75 Stenographers vacancies available in Gauhati High Court and Judicial academy of Gauhati, Assam. For Stenographer Grade II-Must have qualified Degree from a recognized university with Diploma/ITI or its equivalent Certification in Shorthand/Stenography and should have known the Assamese language. For Stenographer Grade III-HSC qualification with Diploma/ITI or its equivalent certificate Stenography/Shorthand and should know the local language of Assamese. The selection for this Gauhati High Court Stenographer Jobs Recruitment 2018 is be based on merit in the written test and typing test/Stenography/Shorthand and interview only. The Selection test will consist of a written test of objective type (OMR based) on English Language Proficiency (50 marks) and Of Language of the State of Assam (Assamese) (20 marks) of 11/2 hour duration. nature and candidates securing at least 40% marks in the Assamese Language segment shall be treated as qualified. Candidate equal to 3 times of the number of vacancies (1:3) in order of merit in the Stenography Test will be called for viva- voce. The final merit position will be determined on the basis of the total marks obtained in the Stenography Test and Viva-voce. The Gauhati High Court reserves the right to fix/alter the cut off marks in the Written Test and Stenography Test. 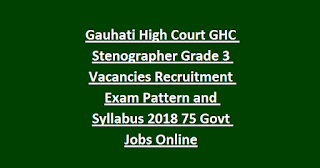 Those candidates who are having the necessary educational qualifications they can apply online for this Stenographer Grade 2 & 3 jobs of Gauhati High Court to be submit online @ghconline.gov.in. Click here to download the official notification of Gauhati High Court Attender, Stenographer Recruitment 2018.